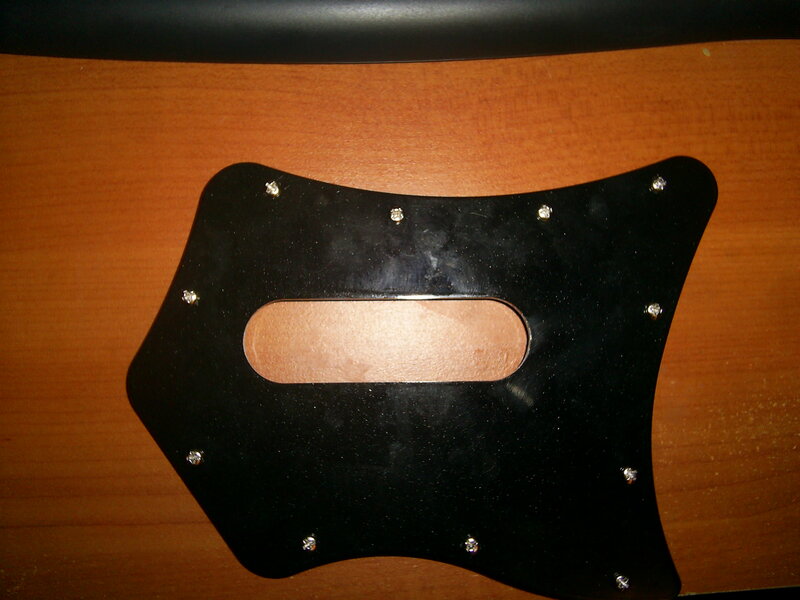 A couple months ago I started working on a design for my next guitar controller. I knew I wanted to do something different with this one. Something more than just paint. I brainstormed a few themes and kept coming back to the idea of doing something zombie related. Probably because I had just finished reading World War Z , and zombies were fresh on my mind. 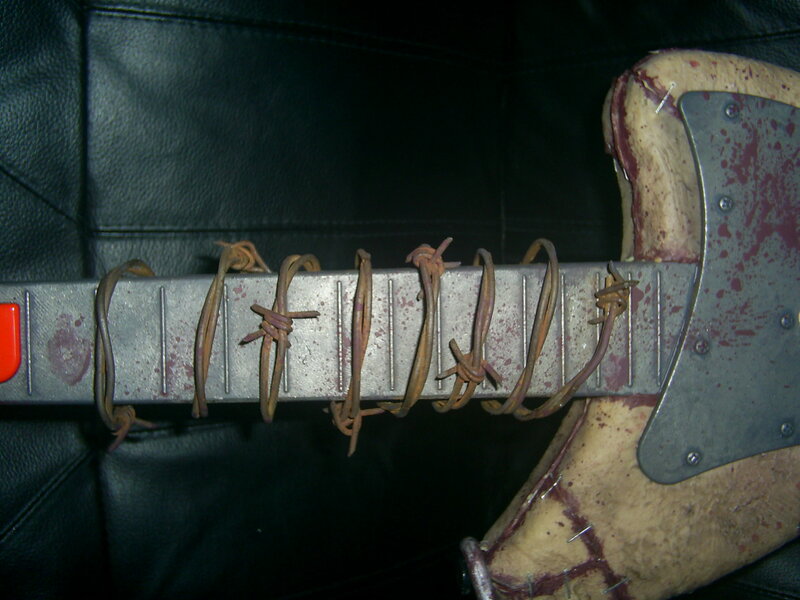 A guitar made of rotting flesh and bone might be interesting. I sketched out some designs. The zombie idea gradually progressed into a general horror theme. 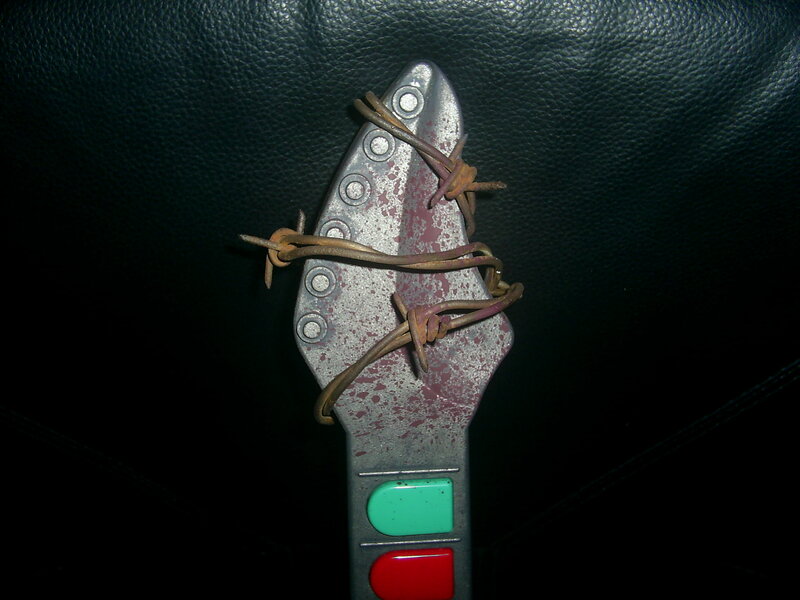 The basic design I came up with consisted of a guitar covered in human skin, a pick guard and neck made of distressed metal and wrapped in barbed wire, a whammy bar made of bone, a rusty chain for a strap, and some blood spatter. At this point I just want to reassure you that I am a perfectly sane individual, and these ideas are not manifestations of a demented psyche. I went to a costume/party store to get most of the materials I needed. I planned on cutting up some Halloween masks and using the latex for human skin. Most of the ones I looked at were either the wrong color or didn’t have enough usable material. I wanted a mask with a realistic looking ear that I could put somewhere on the guitar. I got that idea from the back cover of my Evil Dead Book of the Dead DVD. Some of the masks would have worked but were out of my budget. I was about to lose hope until I saw a Leatherface costume that was perfect. It even had ears on it. There were lots of bone props to look at for the whammy bar. 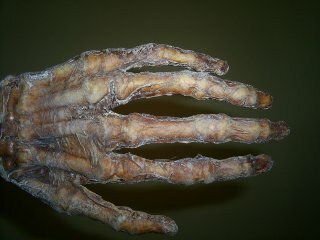 I found a nice mummified skeletal hand. One of the fingers would work nicely, and there were four more to fall back on if I screwed the first one up. I had my choice of either silver or rusted fake barbed wire. I chose the rusted. I looked all over for chains but didn’t find anything that would work. Next stop was Hobby Lobby where I picked up a can of spray adhesive and two bottles of acrylic paint in burgundy and grape to mix for the blood. 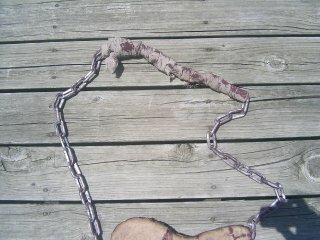 Then on to Home Depot for spray paint and a plastic chain for the strap. I decided to go with a wireless controller this time instead of another SG. I got a cheap “unused” one on eBay. That was probably a mistake. 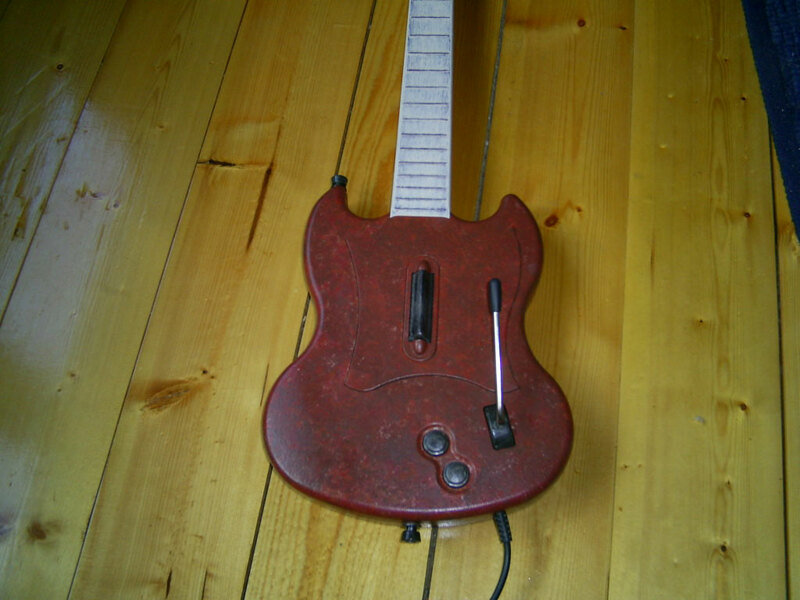 When the guitar arrived I didn’t have any AAA batteries to test it out with. I should have gone out and bought some batteries then, but I was too excited about getting started. I began taking the guitar apart so I could get the painting out of the way. At one point I accidentally dropped the guitar and most of the internal components came spilling out. I quickly surveyed the damage. A few of the leads on a ribbon cable had snapped, part of the strum bar assembly and the strum bar itself was broken, and the PCB for the Start and Select buttons had a crack in it. No problem for the most part. 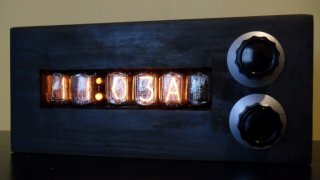 Everything could be fixed with solder and/or glue. Everything but the strum bar. One of the ends was broken off. It had to have been that way when I got it. It’s a pretty thick piece of plastic and there is no way it could have broken when I dropped it. And I never found the piece that broke off. It wasn’t a huge deal. The strum bar was still functional. But it made me wonder if I actually damaged anything or if it was all broken before I got it. I couldn’t really send the guitar back now because I had already drilled holes in the pick guard and put some screws in. As usual, the paint didn’t turn out the way I had it pictured in my head, but I think it still looks pretty good. I cut about two and half inches off the whammy bar. 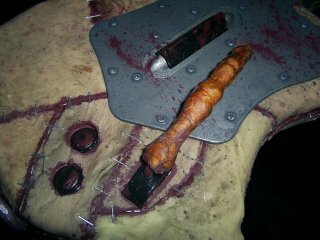 Then cut one of the fingers off the hand, drilled a hole in it, and slid it over the whammy. The skin was pretty simple. Just cut and glue. I had used spray adhesive in the past to glue carpet to fiberglass, but I soon found out that latex and plastic where completely different. The latex just wouldn’t adhere. I ended up using my hot glue gun to stick it on. Then I mixed up some blood and painted the skin seams. I watered it down some and used a toothbrush to get the spray/splatter effect. The staples where probably the most tedious part. The plastic was too hard for the staples to penetrate very far. I cut the legs on each staple down to less than 1/8″. Once the staples were in, I painted each one individually to make them look tarnished. The guitar was ready to be put back together. At this point just about every wire in the thing had broken off at the solder joint. Those things are really thin and it doesn’t take much bending in any direction for them to snap. I went ahead and broke off the ones that were still attached and then soldered them all back to the PCBs. To make sure it didn’t happen again, I covered all the connections with hot glue. By now I had picked up some batteries so I popped them in and fired it up. 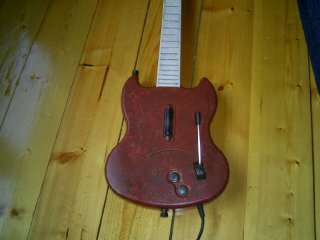 The strum bar and fret buttons all worked. The whammy bar had some problems. 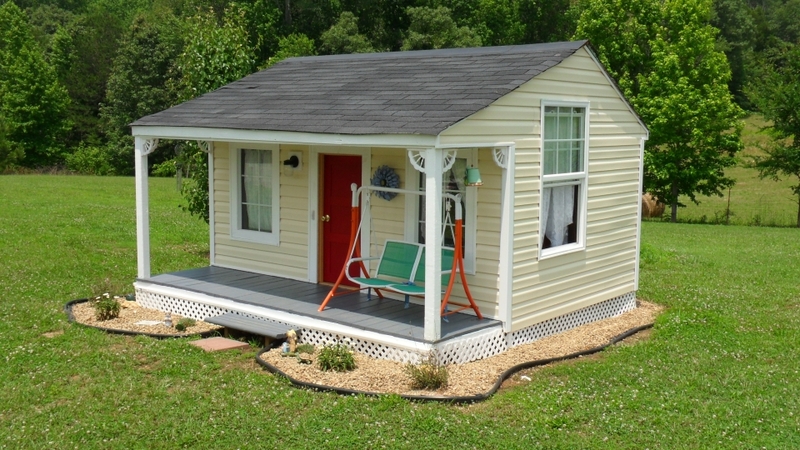 It wouldn’t snap all the way back into the home position. That could be caused by the added weight of the finger. I fixed it a little to where it works most of the time now, but I still need to tweak it some more. The Start/Select buttons still failed to work even though I had attempted to fix the traces in the PCB a couple times. I ended up just replacing the PCB with some small pushbutton switches I had lying around. As soon as I unrolled the fake barbed wire I knew I had made a mistake. The stuff is essentially made from leather boot laces with knots tied every few inches to look like barbs. 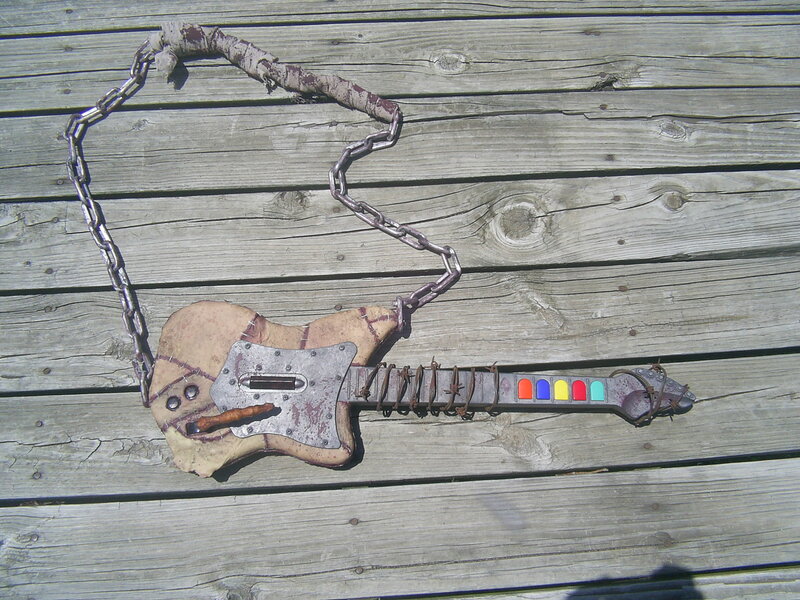 From a distance it could possibly pass for the real thing, but wrapped around the neck of the guitar it looked like crap. I decided it would be best to use the real thing. 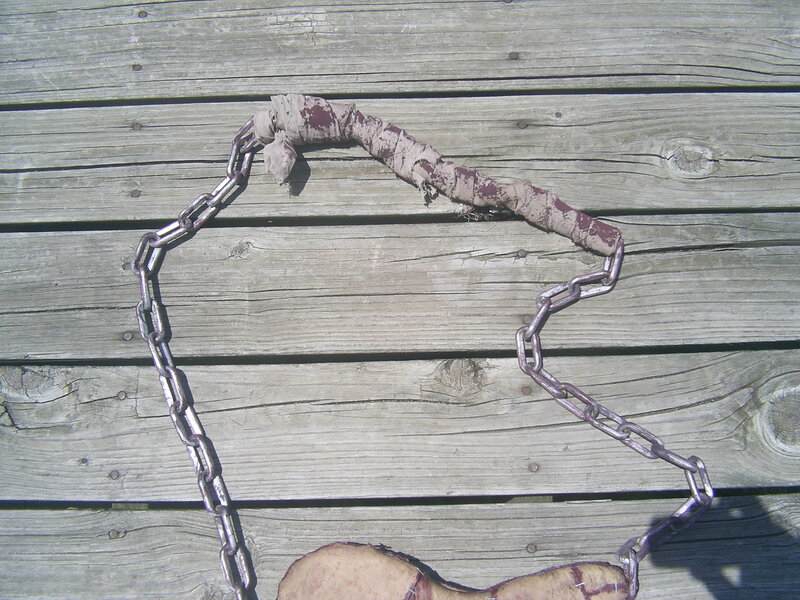 I acquired just over six rusty feet of the real stuff and carefully wound it around the neck. Maybe not the best idea for someone with an accident prone past. I made sure the barbs were positioned where they wouldn’t cut my hand while playing. I sanded each link on the plastic chain and then painted it to match the rest of the theme. 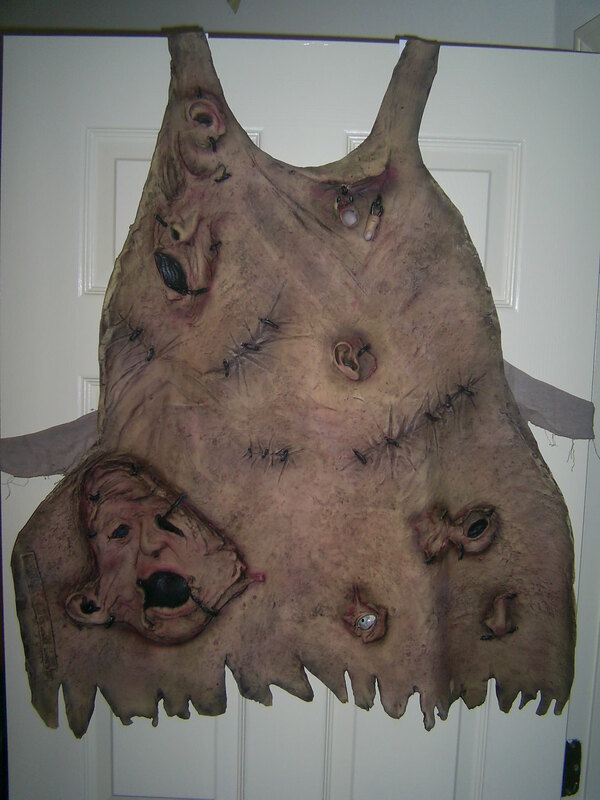 I wrapped the gauze sash from the Leatherface apron around part of the chain to give it a little padding and to keep the paint from rubbing off on my shirt. Of course I had to paint some blood onto it. In these pictures the blood looks kind of purple. It really has more of a reddish tint. The square area on the back of the guitar is the battery cover, so I couldn’t staple those seams. The on/off switch is covered up but can still be manipulated through the skin. The power LED is also visible through the skin when lit. CPU: Intel Core2 Duo E6600. I was originally going to go with the x6800, but after looking at benchmarks I realized that the performance increase over the E6700 wasn’t worth all the extra cash. Then I dropped another level to the E6600 to save a little more money. I currently have it overclocked to 2.85 GHz. Motherboard: EVGA nForce 680i SE SLI 775 TR. Memory: 2GB Crucial Ballistix Tracer DDR2 PC2-6400. Hard Drives: (2) 160GB SATA II Hitachi Deskstar. Right now I have these drives set up in a RAID 0 array. Graphics: PNY 8800 GTS 320MB PCIe. It’s the bottom line of the 8800 series. I may get another one of these cards in 6 months to use for SLI. Power Supply: 580W Hiper Type-R. Modular power supplies are the way to go. You don’t have those unused wires taking up space in the case anymore. This PSU came in a nice plastic toolbox that’s great for storing all my extra cables, screws, and other hardware. CPU Cooler: Zalman CNPS9700 NT. This thing is more massive than the pictures would lead you to believe. It keeps my CPU at 30C idle and 44C under load. Monitor: Samsung 225BW. At first I was looking at 24″ monitors, but I thought that might be too big so I went with a 22″. Now I think 24″ might not have been so big after all. I’m still using my old mouse and DVD burner. The only other new piece of hardware I got is a Merc keyboard. I was hoping to be blogging from my new computer today, but there is going to be a delay. The power supply I bought does not have the 8-pin connector that my motherboard requires. I knew the motherboard needed the new P8 power connector for dual core processors, and I made sure that the original power supply I picked out had that connector. Later I decided on another PSU and forgot to check on the P8. I can still use the PSU I bought, it just needs an adapter for the P8. I ordered it on Thursday. Maybe I’ll have it by Monday or Tuesday. For the past couple of weeks I’ve been playing around with Vista at work. I like it. I like it so much that I bought it. Sure, it has a few issues that need to be worked out (mostly just hardware and software compatibility), but XP had the same growing pains when it was released. That copy of Vista has been sitting on my desk for a while. The computer I’m using now is perfectly capable of running it, but it feels so outdated. Single core CPU. AGP graphics. Parallel ATA hard drive. 17″ CRT. I’m still computing in 2003. Six months ago I spec’d out the components I wanted for a new computer. I’ve been reading reviews, looking at benchmarks, and watching price fluctuations ever since. Last week I began purchasing parts for a new system. I had to downgrade a few components to fit everything into my budget. They should start showing up over the next few days and by this weekend I’ll have a new computer. Last night I finished painting my second GH controller. It didn’t turn out the way I had it pictured in my head, but nothing ever does. 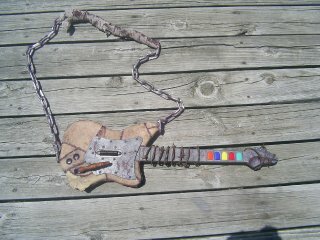 I was going for a faux rust finish body with worn wooden neck. Parts of it turned out great and other parts look like crap. At least it’s better than plain black and white. I’m probably going to end up with quite a collection of guitars. Red Octane is producing a wireless version that I’m sure I’ll get eventually, and then there’s the 360 controller that I plan on modding.